Seeking Purpose…Finding Futility Part 2: Caught in an Endless Cycle? 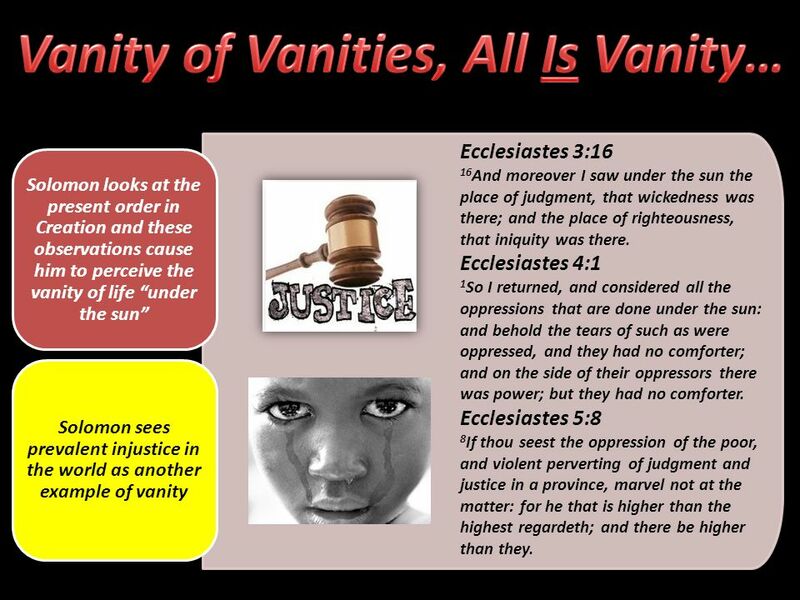 Seeking Answers A Study in Ecclesiastes Lesson 12, January 11, 2012. 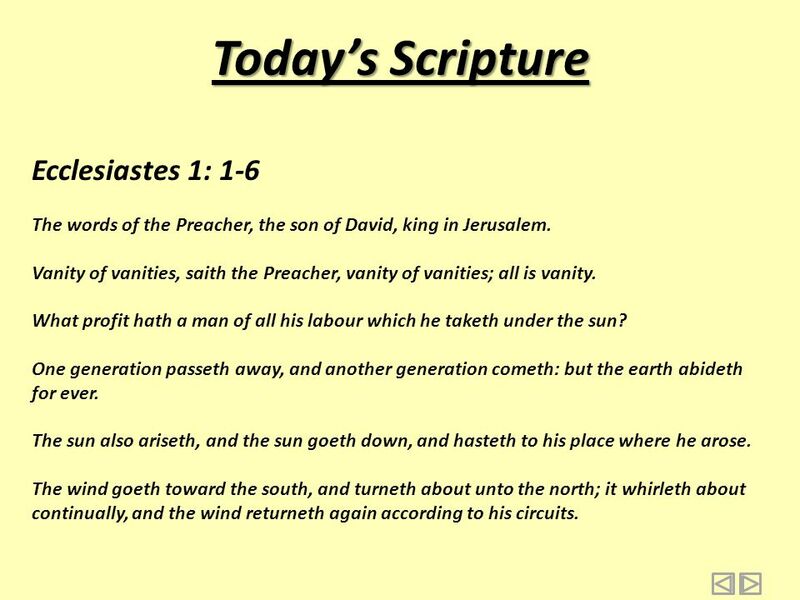 2 Todays Scripture Ecclesiastes 1: 1-6 The words of the Preacher, the son of David, king in Jerusalem. 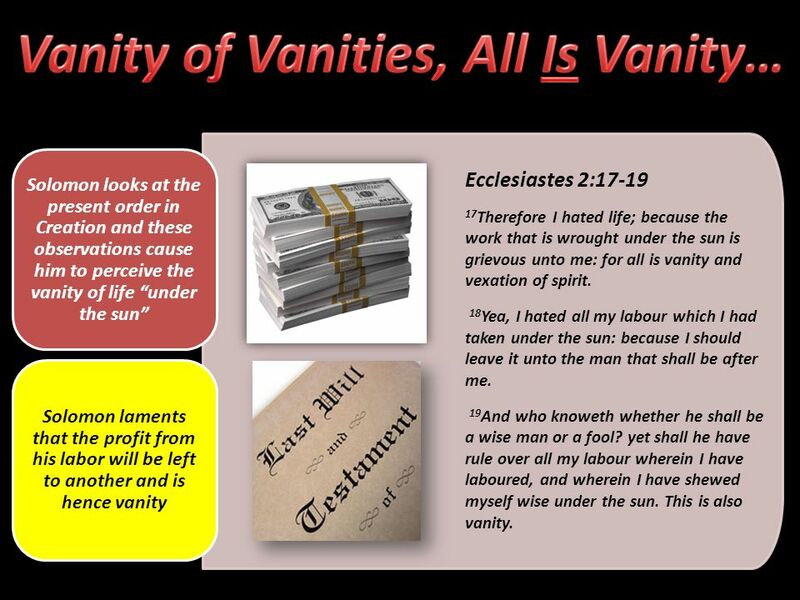 Vanity of vanities, saith the Preacher, vanity of vanities; all is vanity. 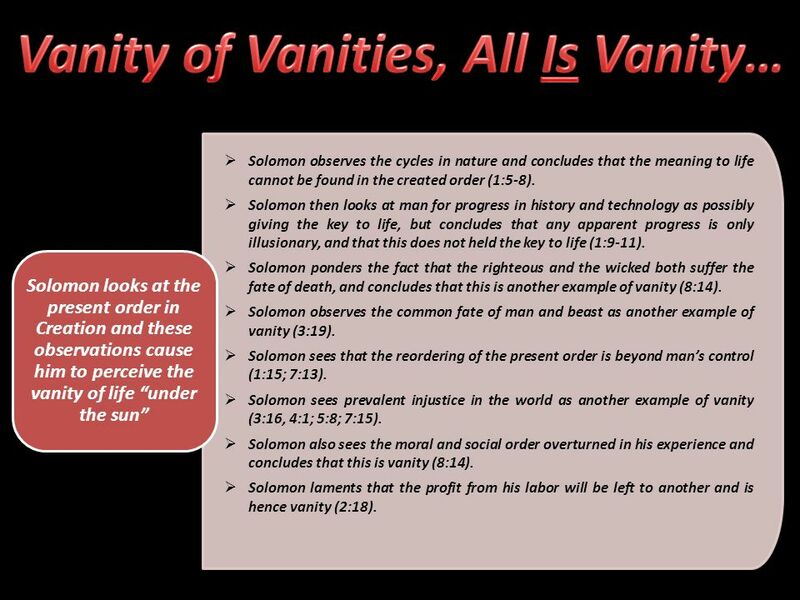 What profit hath a man of all his labour which he taketh under the sun? One generation passeth away, and another generation cometh: but the earth abideth for ever. The sun also ariseth, and the sun goeth down, and hasteth to his place where he arose. The wind goeth toward the south, and turneth about unto the north; it whirleth about continually, and the wind returneth again according to his circuits. 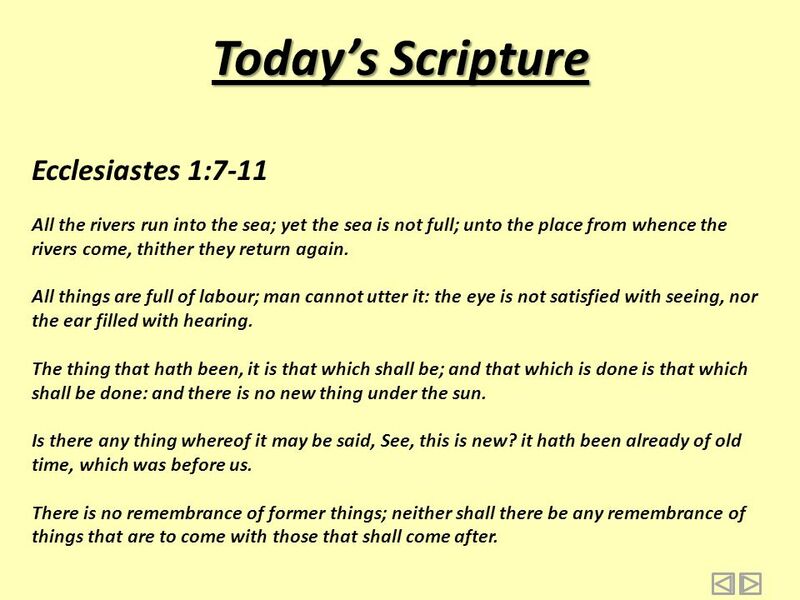 3 Todays Scripture Ecclesiastes 1:7-11 All the rivers run into the sea; yet the sea is not full; unto the place from whence the rivers come, thither they return again. All things are full of labour; man cannot utter it: the eye is not satisfied with seeing, nor the ear filled with hearing. The thing that hath been, it is that which shall be; and that which is done is that which shall be done: and there is no new thing under the sun. Is there any thing whereof it may be said, See, this is new? 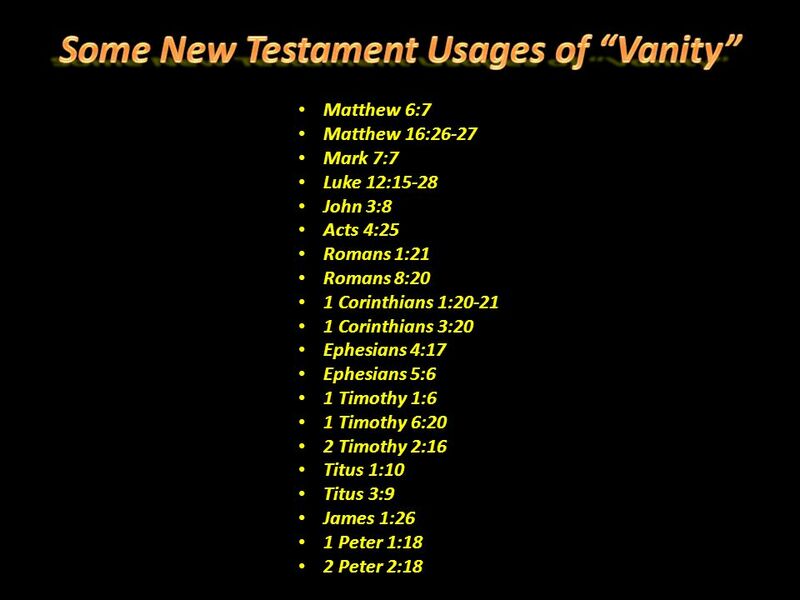 it hath been already of old time, which was before us. 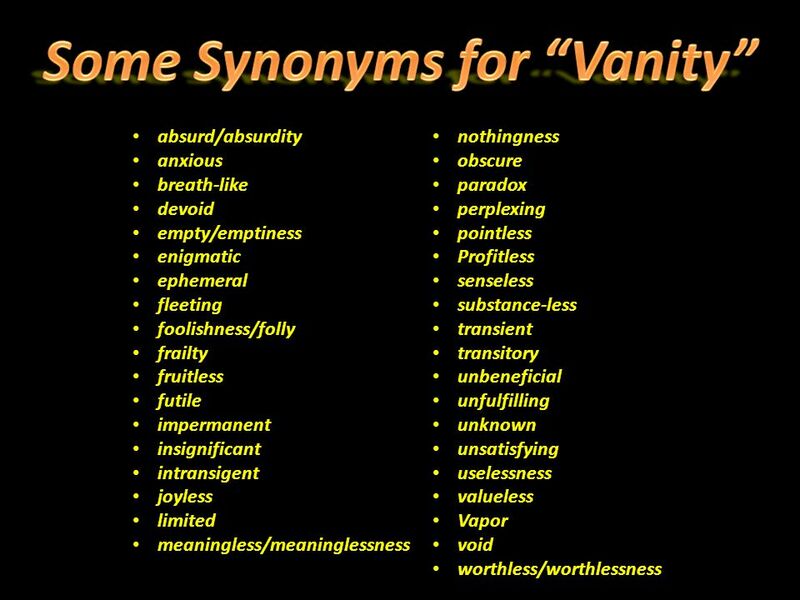 There is no remembrance of former things; neither shall there be any remembrance of things that are to come with those that shall come after. 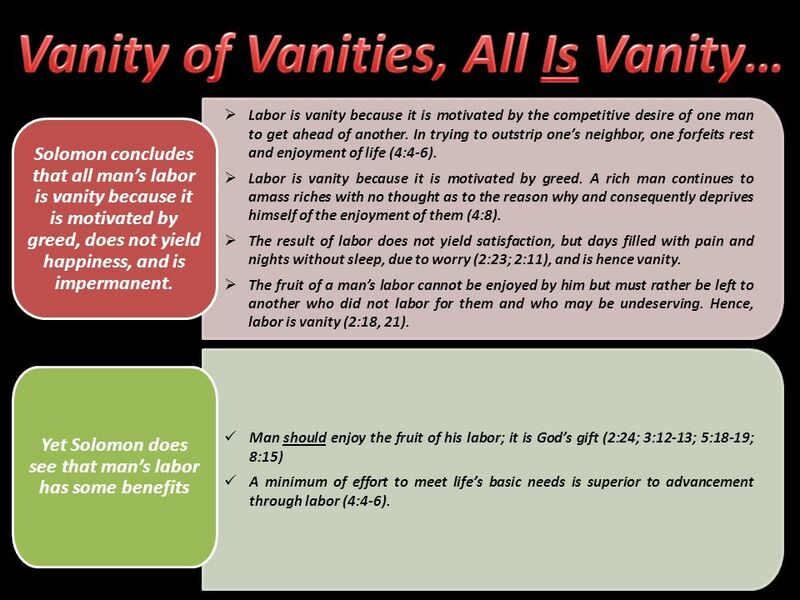 5 The end of labor is to gain leisure. -- Aristotle -- ?????? 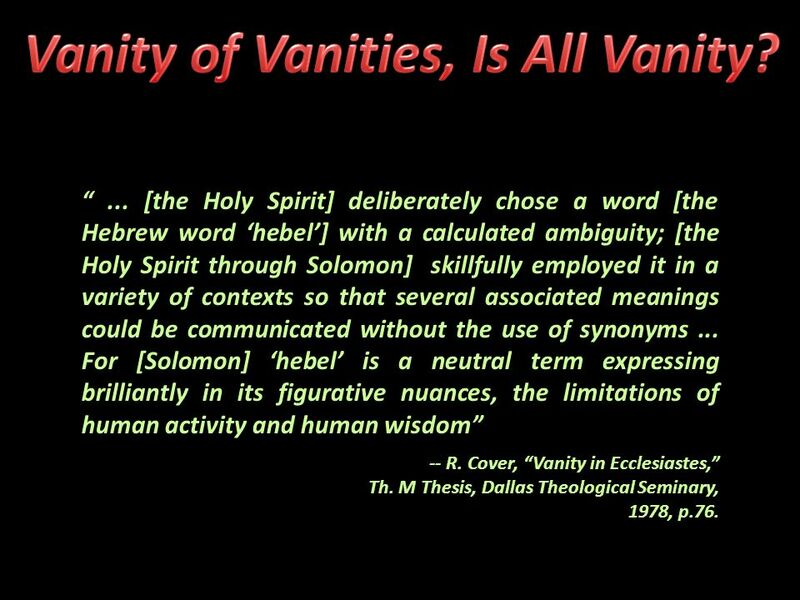 8 ... [the Holy Spirit] deliberately chose a word [the Hebrew word hebel] with a calculated ambiguity; [the Holy Spirit through Solomon] skillfully employed it in a variety of contexts so that several associated meanings could be communicated without the use of synonyms... For [Solomon] hebel is a neutral term expressing brilliantly in its figurative nuances, the limitations of human activity and human wisdom -- R. Cover, Vanity in Ecclesiastes, Th. 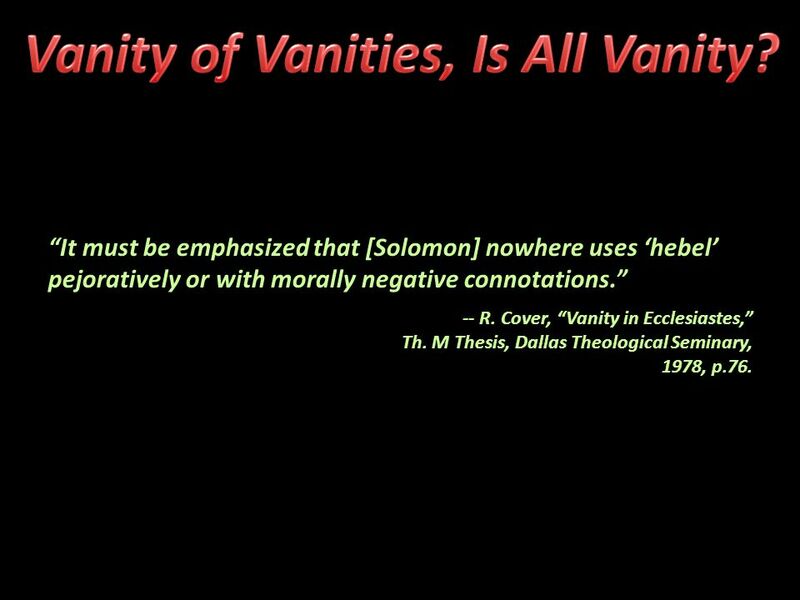 M Thesis, Dallas Theological Seminary, 1978, p.76. 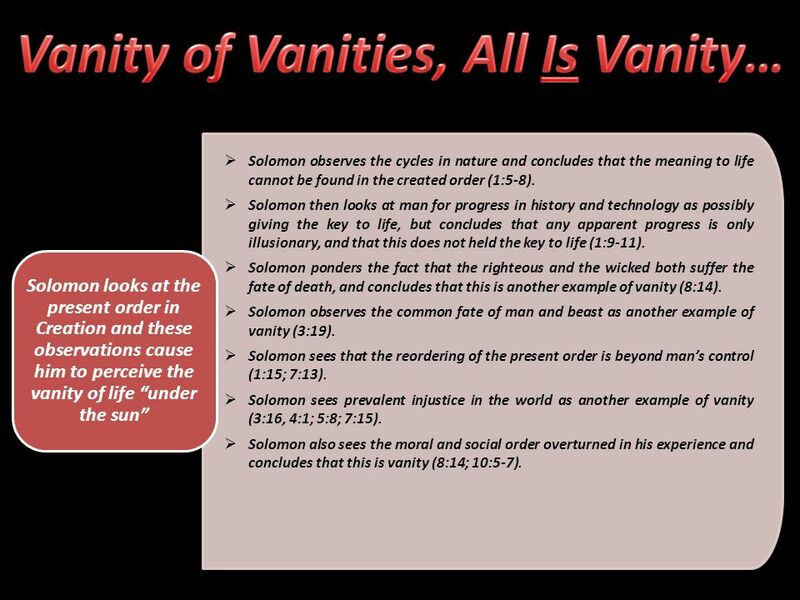 13 It must be emphasized that [Solomon] nowhere uses hebel pejoratively or with morally negative connotations. 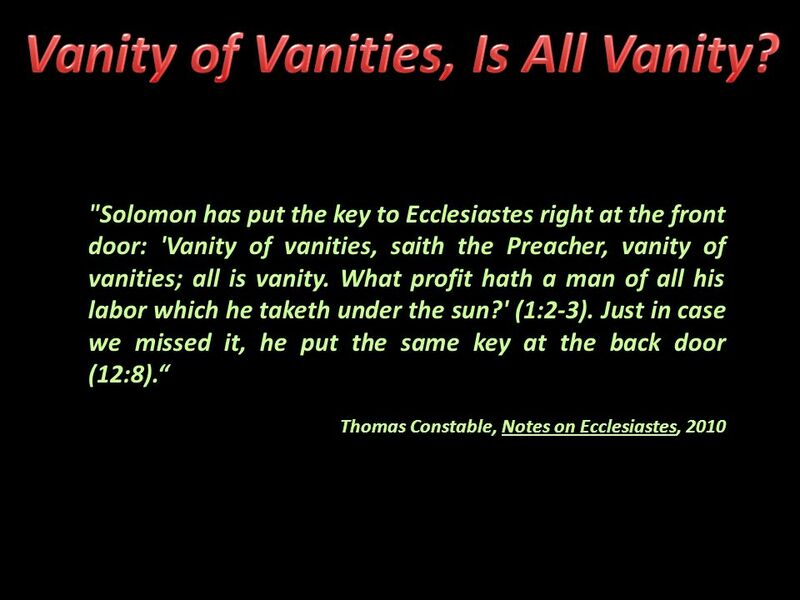 -- R. Cover, Vanity in Ecclesiastes, Th. 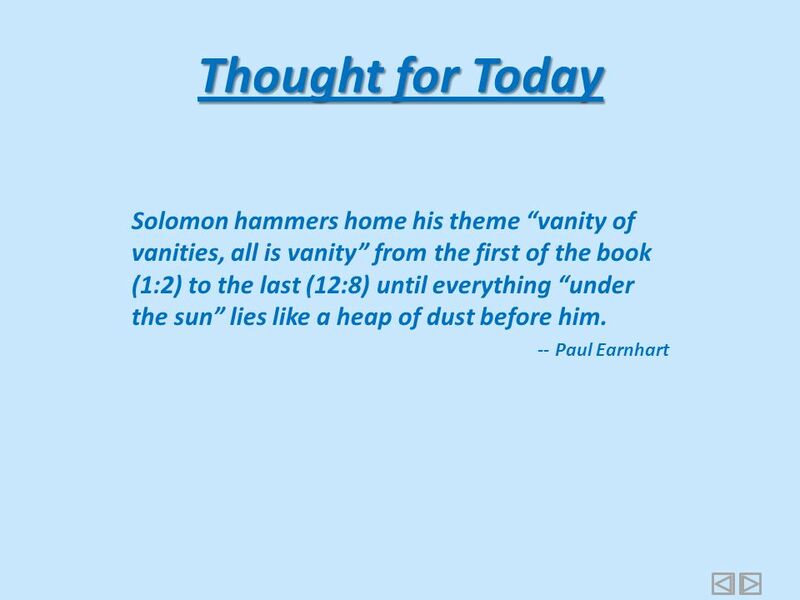 M Thesis, Dallas Theological Seminary, 1978, p.76. 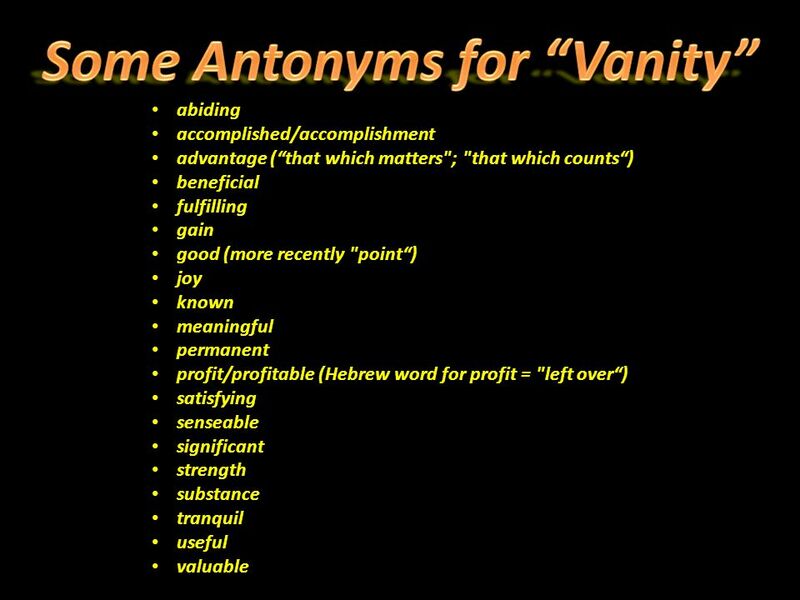 39 Wisdoms pursuit yields grief and is thus vanity (1:18). 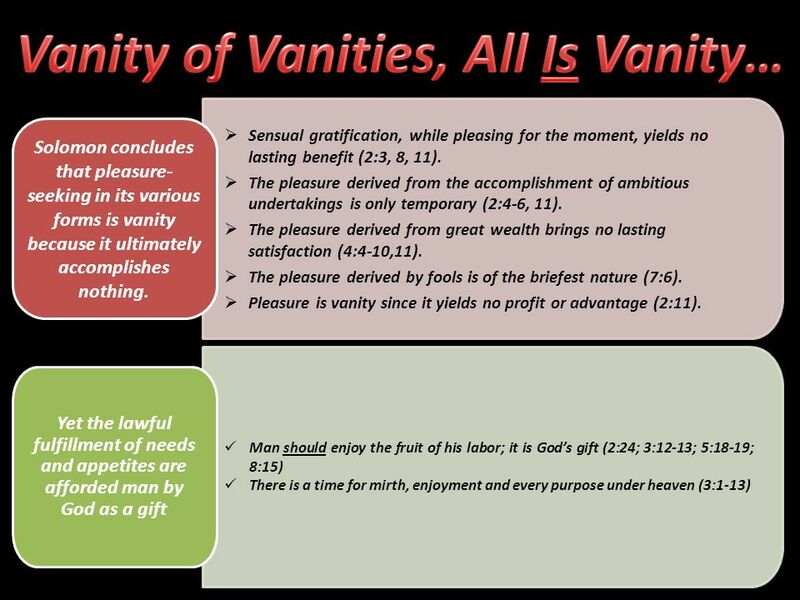 Wisdom is vanity because its advantages are seen in this life only (2:15). Wisdom doesnt guarantee success since its advantage can be vitiated by various means. 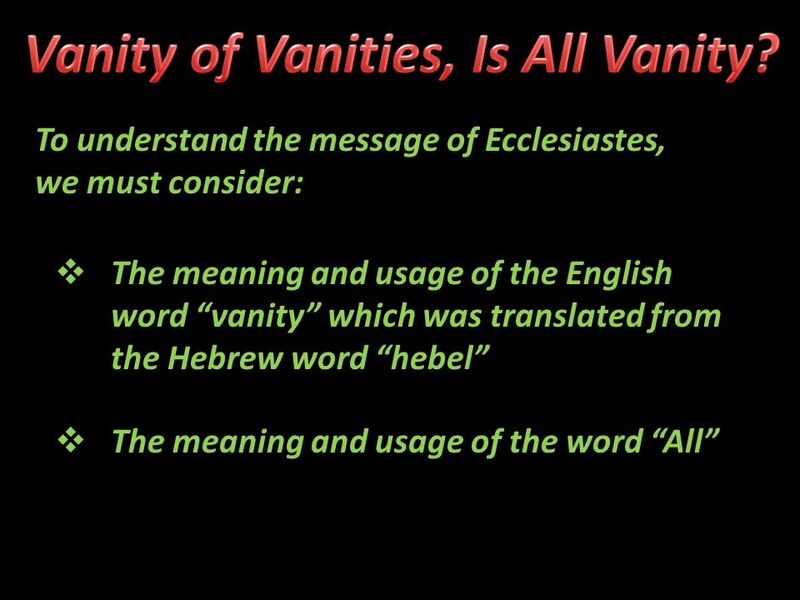 It is thus vanity (10:10). Wisdoms advantage can be thwarted by unpredicted misfortune (9:11). 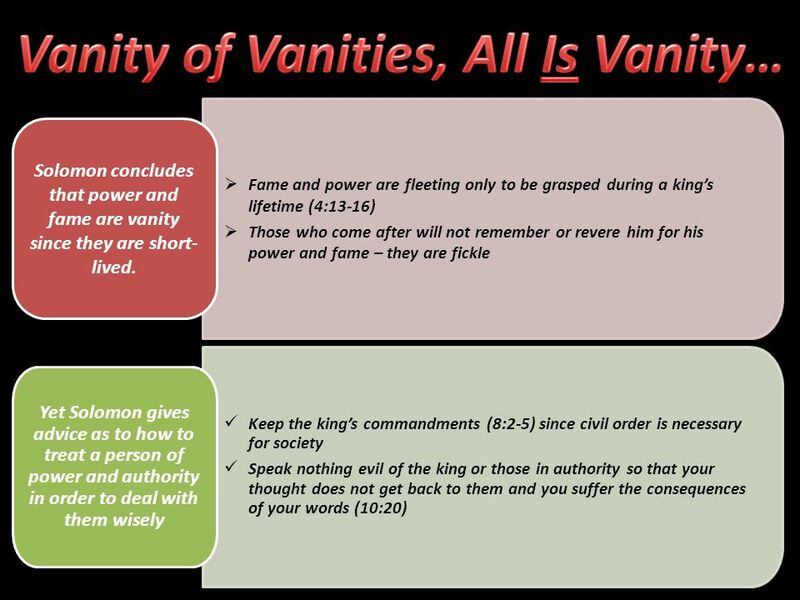 Wisdoms advantage can be thwarted by sin and folly (9:18, 10:5-7). Wisdoms advantage can be thwarted by improper timing (10:8-11). 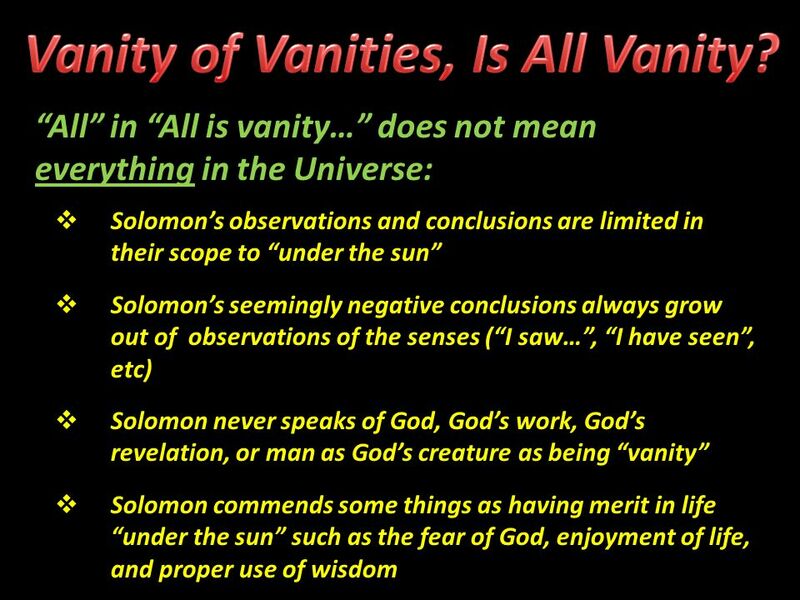 Solomon concludes that wisdom is vanity since, rather than give meaning to life, it gives only a temporary advantage. Wisdom is superior to folly since it illumines a man (2:14, cf. 8:1). Wisdom is superior to strength in that it can bring victory even against seemingly impossible odds (9:16-18). 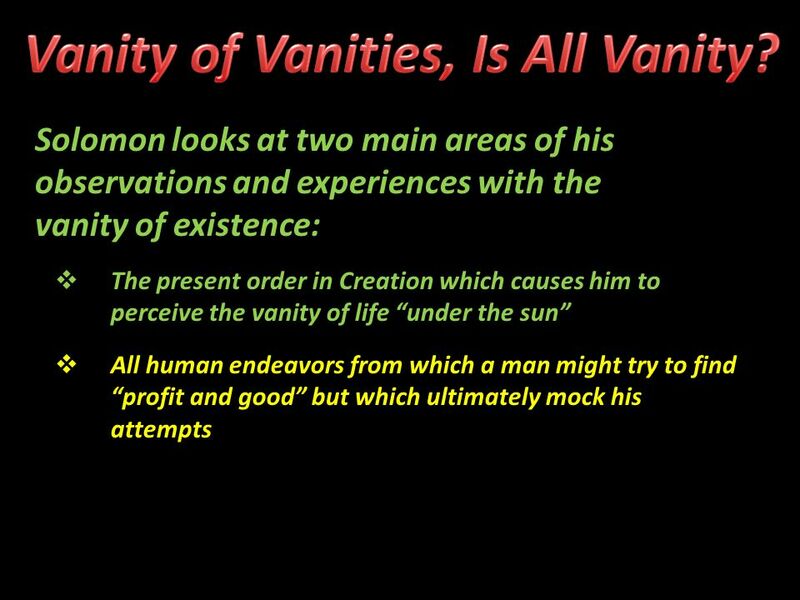 Wisdom is superior to fame because fame is so fleeting (4:10-14). 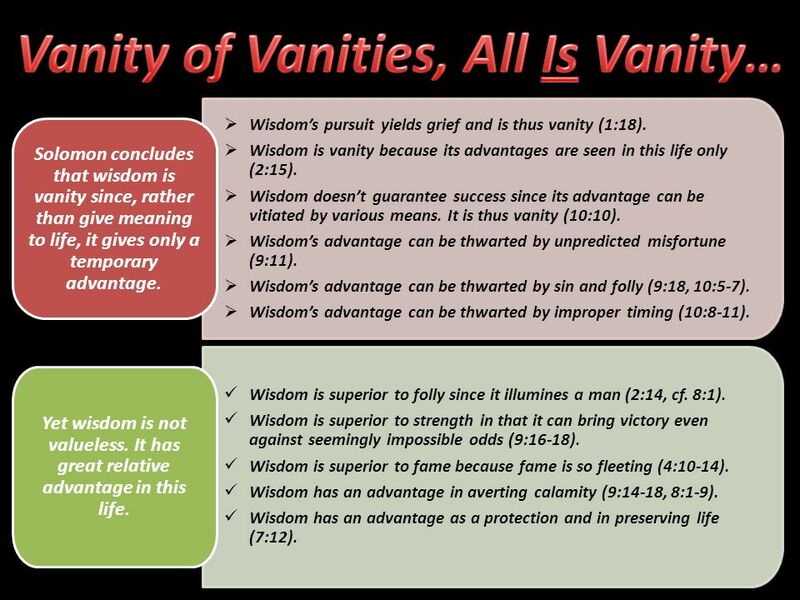 Wisdom has an advantage in averting calamity (9:14-18, 8:1-9). Wisdom has an advantage as a protection and in preserving life (7:12). 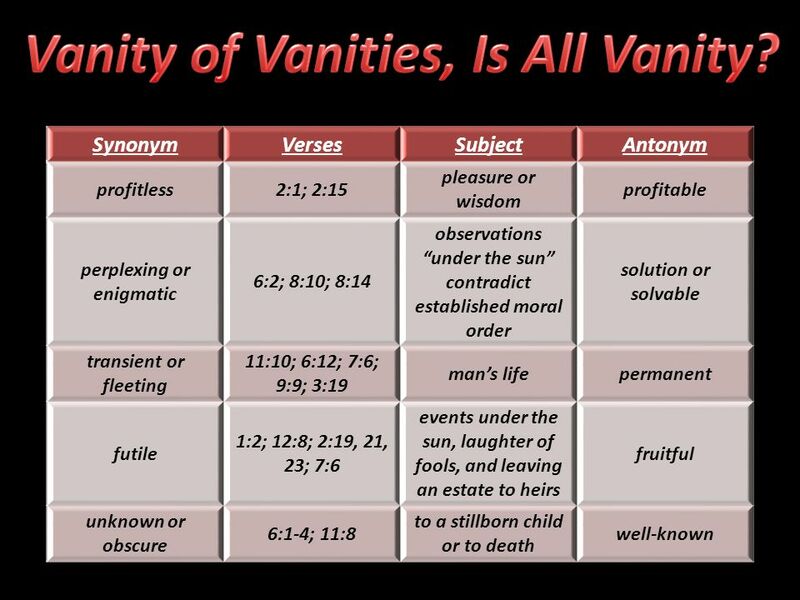 Yet wisdom is not valueless. It has great relative advantage in this life. Download ppt "Seeking Purpose…Finding Futility Part 2: Caught in an Endless Cycle? 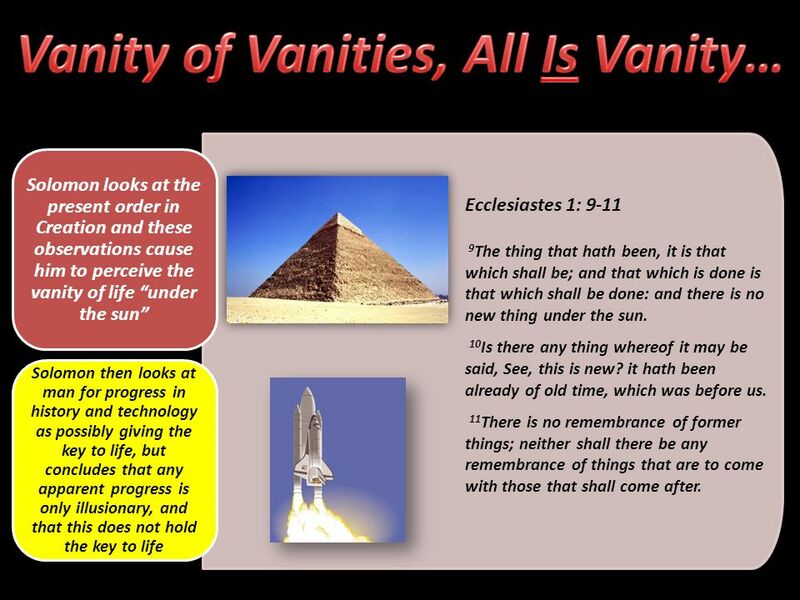 Seeking Answers A Study in Ecclesiastes Lesson 12, January 11, 2012." 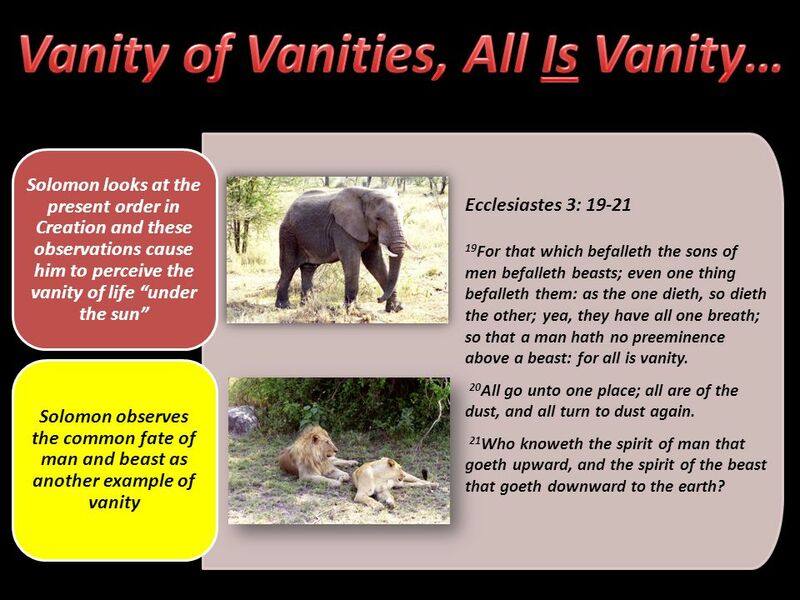 Seeking Life…Finding Death Part 1: Is All I See Vanity? 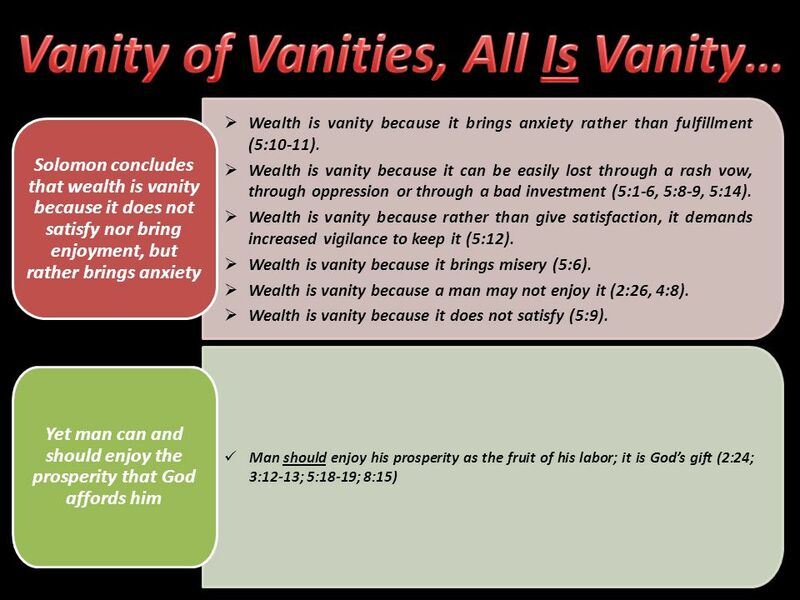 Seeking Answers A Study in Ecclesiastes Lesson 15, January 22, 2012. The 23 rd Psalm (Part 2). The LORD is my shepherd; I shall not want. He maketh me to lie down in green pastures: he leadeth me beside the still waters. God, Who is He & What Does He Want?. God – who is He and what does He want? 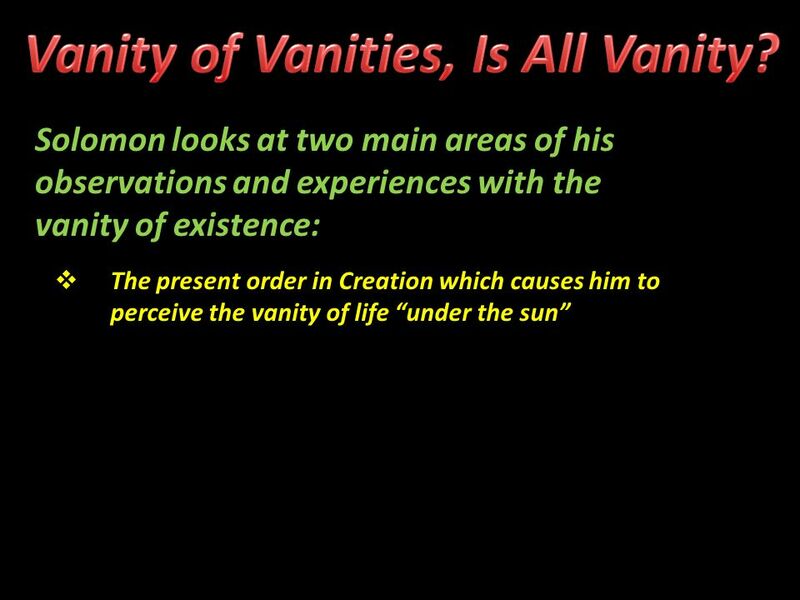 The author of the Bible The creator of the universe The only God Eternal and. 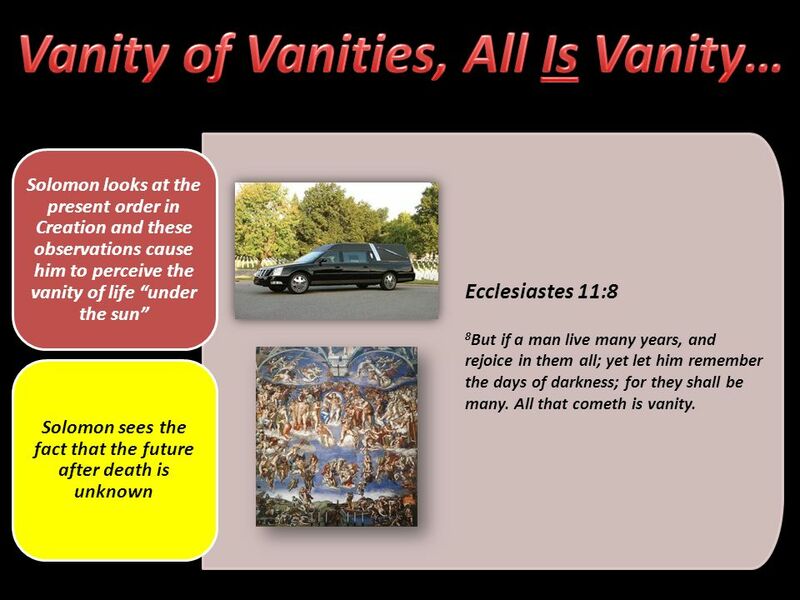 Why Funerals Are Better Than Weddings Ecclesiastes 6:10-7:29. LESSON 15 ABIDE IN CHRIST ABIDE IN MY LOVE BE READY THE WORLD WILL HATE YOU THE WORK OF THE HOLY SPIRIT YOUR SORROW WILL TURN TO JOY JESUS’ PRAYER Life. 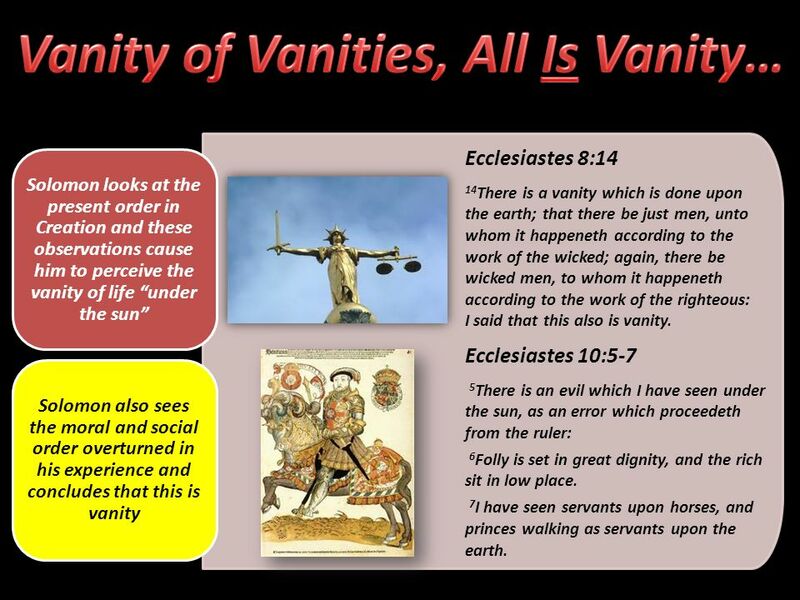 The Book of Ecclesiastes How To Live Life Wisdom from God. Seeking Life…Finding Death Part 3: Elusive Success, Certain Failure Seeking Answers A Study in Ecclesiastes Lesson 17, January 29, 2012. 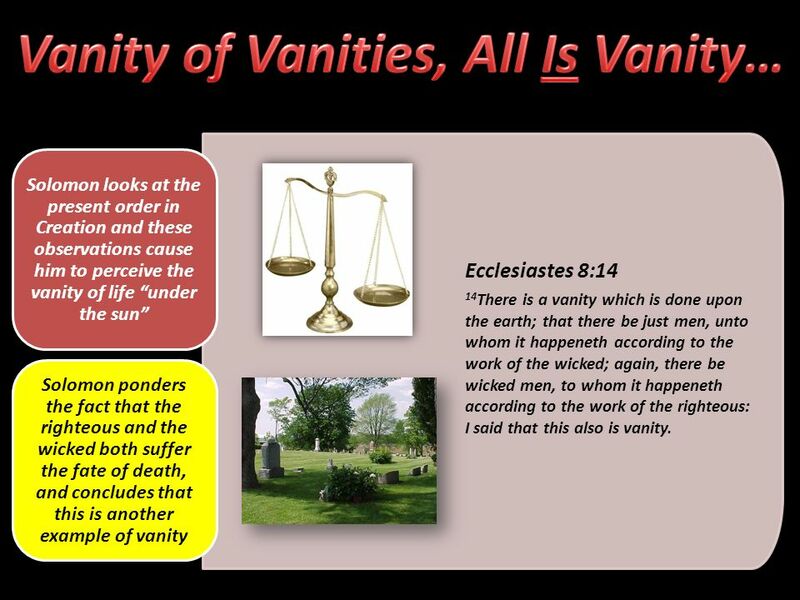 Seeking Purpose…Finding Futility Part 1: Vanity of Vanities, Is All Vanity? 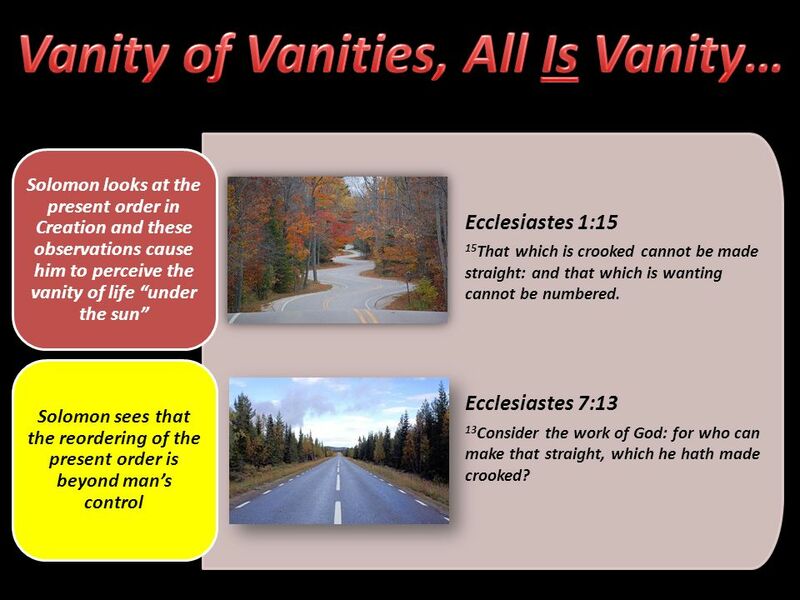 Seeking Answers A Study in Ecclesiastes Lesson 11, January 8, 2012. …. 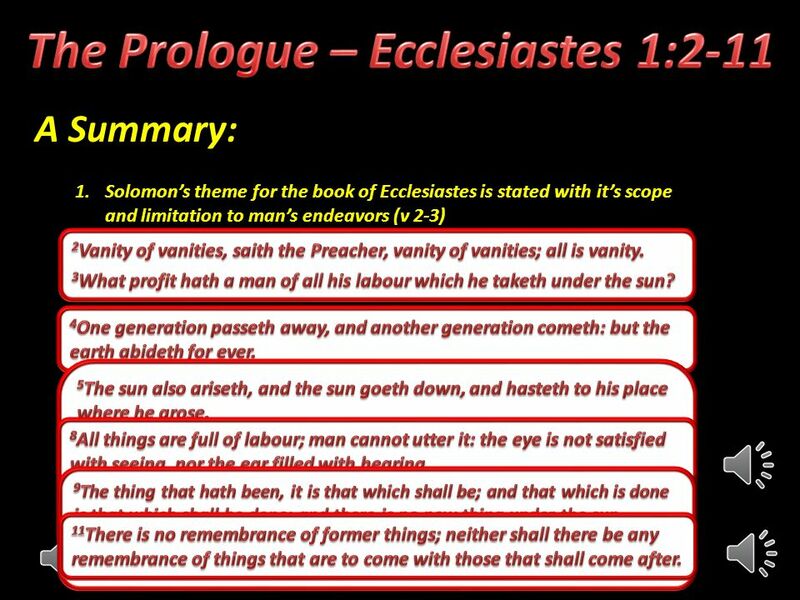 United Kingdom – Part 2 Lesson 21 Ecclesiastes.